Standing tall, proud and patriotic, this dazzling free-standing spray is like a fireworks display made of graceful flowers. Uniquely beautiful, it's a lovely way to honor a great loss. • A gorgeous selection of flowers such as white lilies and snapdragons, blue delphinium, red carnations and miniature carnations, eucalyptus and more create this all-American spray. 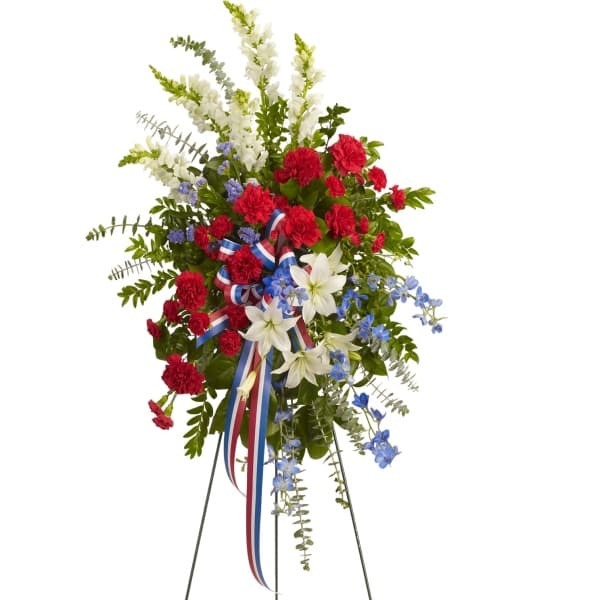 • This arrangement measures approximately 27" W X 42" H.
Flowers will be received by a Adkins Funeral Home's staff. 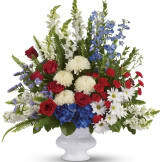 This is the second time that I have ordered flowers through The Sympathy Store in the last few months. The service is so convenient and efficient. The flowers were beautiful and done nicely. I was well pleased with the beautiful spray. It looked great. Thanks. I was very pleased with the arrangement I purchased. It was exactly what I expected from the picture. This arrangement was absolutely perfect for my grandfather's memorial service. 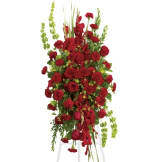 The flowers were high quality, and the whole thing was beautifully put together. The ordering process was very easy, and the arrangement was there when we arrived. I didn't have to worry about it at all. Thank you! Disappointed overall-- nothing like the photo. I counted 10 red carnations, 5 white roses and a few white sprays. If any blue flowers not at all noticeable. Not only not a red white and blue ribbon but no ribbon at all! Looked underwhelming for $140.00. It was delivered promptly. Overall the spray was nice, yet due to seasonal substitutions it did not look like the same spray at all. It was a little sparse and did not give the same overall feel. Also the bow was red, not red white and blue . I assumed I did not have to specify based on the name and photo of the spray. It was ok but I probably would have ordered a different spray if I was notified about the changes. This is a very nice arrangement, thank you!! 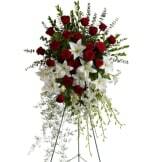 All of our flowers are designed and delivered by hand from a local florist in in Enon.